Hey kids! 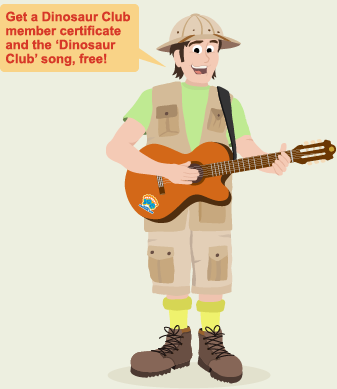 You’ll need mum and dad’s permission to become a Dinosaur Club member. Let them know that, around here, the Spamosaurus is definitely extinct. We’ll send you just one email every month, containing things like free colour-in sheets, cool competitions, news on our dinosaur friends, new songs and free downloads. To stay in touch more often, mum and dad can elect to become Jurassic Joe’s friend on facebook. By submitting you agree that you are not an actual dinosaur. Membership is limited to humans aged 3 – 103 and the dinosaurs that are already in the club.